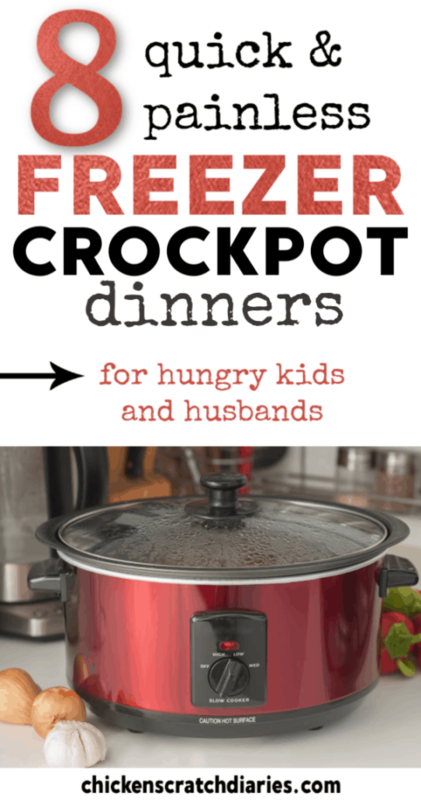 I discovered the liberating goodness of crockpot freezer meals only a few months ago. Finally, right? I really wish I would have taken the time to prepare some freezer meals in those postpartum days with new babies in the house. What a blessing that would have been! I think the thought of standing on my feet to make a bunch of food at once was just overwhelming at the time. If I had known I could actually make a weeks’ worth of freeze ahead crockpot meals in about one hour total, I would have at least made the effort! As my life got busier and busier over the last year with work + life in general, I started looking at ways I could be more efficient in the kitchen. Meal planning has been a lifesaver over the years, but recently I wanted to try meal planning PLUS freezer cooking to up my game. 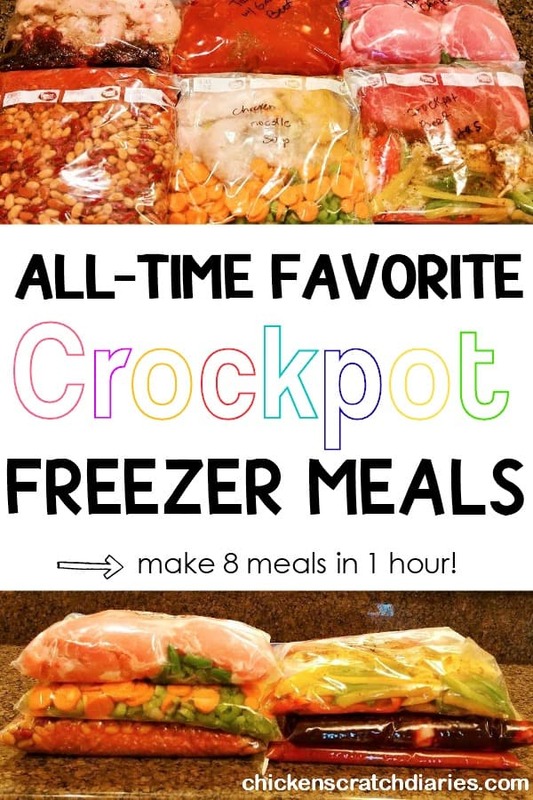 Although crockpot meals in general are my go-to for busy days, I knew that finding a few tried-and-true crockpot freezer dump meals would save even more time. When I started searching for the best freezer meal recipes online, it seemed like I had to scroll through countless pages before I found a combination of recipes my family would actually eat plus those that were fairly budget-friendly. As a family of 6, we definitely adhere to the waste-not-want-not philosophy in the kitchen! Not only do we feed 6 people, we like recipes that provide a few leftovers to keep us from eating out during the week. It took a while, but I finally found success with the recipes below! Some of them are actually meals I’ve been making for a long time and I just adapted for the freezer. I’ve provided links to the other recipes. If you’re like me and CANNOT STOMACH Manwich – try this homemade version instead. It’s so much better! This kid friendly staple can go from freezer to crockpot OR made on the stovetop if you prefer. Add all ingredients including the raw ground beef into a gallon freezer bag. Separate the beef a little by squishing it with your fingers in the sealed bag. Make sure to get as much air out as possible. Thaw out in refrigerator overnight; add contents to slow cooker the next morning. Add 1/4 cup water and cook approximately 6-8 hours on low. *Cook times will vary greatly depending on your slow cooker. You may need to add more water towards the end of the cooking process for desired consistency. Spoon mixture into hamburger buns and serve with sweet potato fries (optional). I’m all about seasoning foods myself rather than using packets, most of the time. It’s more economical and I can adjust the spices to suit the heat level and flavors that we prefer. Adding your own spices is more healthier (no preservatives), and more economical than buying seasoning packets- and it allows you to adjust the recipe to suit your tastes! Rinse and drain all beans in a colander. Add beans and all other ingredients to a gallon ziplock freezer bag. Separate ground beef a little by squishing the sealed bag with your fingers. Make sure all the air is out of the bag before sealing; freeze. Defrost bag in fridge overnight. Dump contents of bag into crockpot / slow cooker and add enough water to cover the mixture plus about a 1/2 inch more. Cook on low approximately 6-8 hours. *Cook times vary greatly according to slow cooker. Check frequently and add more water if necessary. Spoon into bowls and top with shredded cheddar, sour cream and chopped green onions. Serve with cornbread. Easy, tender boneless ribs with a mild kick (don’t forget the chipotle!). With the time you save on the main dish, you can whip up a batch of my Thrifty Homemade Bread. Chipotle seasoning adds an extra layer of flavor to this delicious main dish! Add ribs to a gallon ziplock bag along with all other ingredients; freeze. Thaw in refrigerator overnight before cooking. Cook on low approximately 6-8 hours. 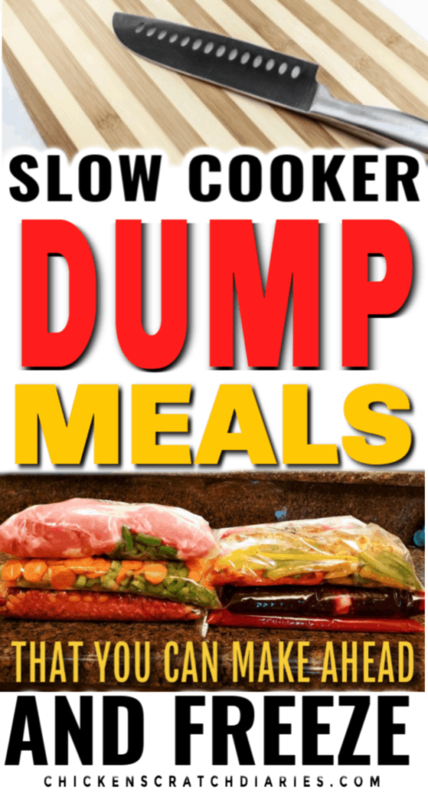 *Cook time will vary greatly depending on your particular slow cooker. Serve with green beans and biscuits or homemade bread. This recipe is adapted from this recipe, with a few modifications. (We did NOT like the dried egg noodles, it had a strange gummy flavor when cooked in the crockpot!) On the day of cooking, you could also add a Bay leaf to the crockpot for extra flavor – just remember to remove it before serving! Add all ingredients EXCEPT egg noodles and chicken broth to a gallon size freezer bag. Freeze until ready to cook. Add to slow cooker with broth on low for approximately 6-8 hours. *Cook times will vary greatly depending on slow cooker. Remove chicken tenders and shred/chunk with two forks once cooked through. Add back to crockpot. Add frozen egg noodles the last 15-20 minutes; serve once noodles are cooked through. This recipe from New Leaf Wellness is great and super simple. I like to serve it with a fresh side salad and a baked potato. TIP: After washing your potatoes and drying them, poke holes with a fork and then rub them down with olive oil, sprinkle with sea salt and cook in microwave. This was one of my personal favorites of all the freezer meals for crockpot that I’ve tried. It is adapted from the recipe on this page, so that it would feed my family of 6, plus leave some leftovers. Combine all ingredients except for tortellini, cheeses and water; add to gallon-size ziplock bag. Break up the raw ground beef by squishing the sealed bag slightly with your fingers. Freeze until day prior to serving. Defrost in refrigerator overnight before the day of cooking. Add all ingredients from freezer bag to slow cooker; cook approximately 8 hours on low until ground beef cooked through. 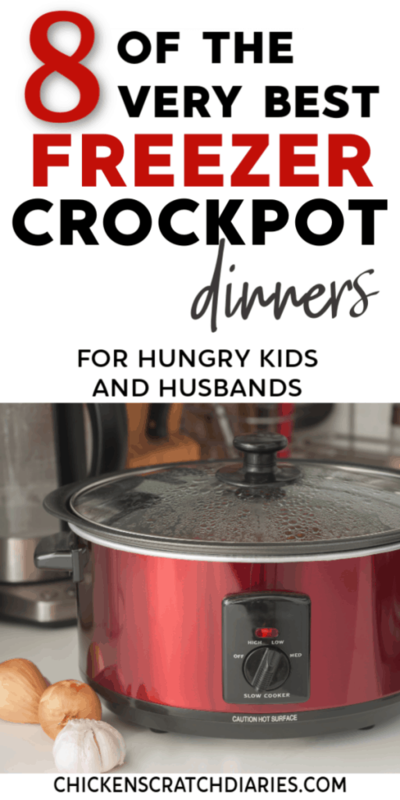 *Cook times will vary greatly depending on slow cooker. Add 1 cup water; stir. Add the 2 packages of frozen tortellini, stir. Top with the shredded cheeses and cook until tortellini is cooked through, approximately 40 minutes. This is another recipe from New Leaf Wellness- and it ranks #1 on my list of favorite slow cooker freezer meals! I really like the recipes on this site because they use a lot of whole-food ingredients and again, I like to season things myself instead of using pre-mixed packets. Feel free to experiment with the seasonings in this recipe- add more chili powder if you like a spicier version. The Chipotle seasoning gives it a nice, smoky-rich flavor. Add all ingredients EXCEPT for the vegetable stock to a gallon-size freezer bag. Break up the raw ground beef in the sealed bag by squishing slightly with your fingers. Freeze. Defrost in refrigerator overnight prior to cooking. Empty defrosted ingredients into slow cooker; add vegetable stock. Cook approximately 6-8 hours on low until ground beef is cooked through. *Cook times will vary greatly depending on your slow cooker. Monitor liquids and add more water towards the end of cook time, if needed. There you have it! Over a weeks’ worth of crockpot freezer meals to give you at least a week off from cooking. With all the leftovers, you may even get a two-week break from the kitchen! • 20 Quick Dinner Ideas: Homemade + No Recipe Required!